Screen space reflections are such a pain. When combined with taa they are even harder to manage. Raytracing against a jittered depth/normal g-buffer can easily cause reflection rays to have widely different intersection points from frame to frame. When using neighborhood clamping, it can become difficult to handle the flickering caused by too much clipping especially for surfaces that have normal maps with high frequency patterns in them. By adding to Stingray a history depth buffer and using the previous view-projection matrix I was able to confirm this approach could successfully reproject reflections. Ghosting was definitely minimized under camera motion. 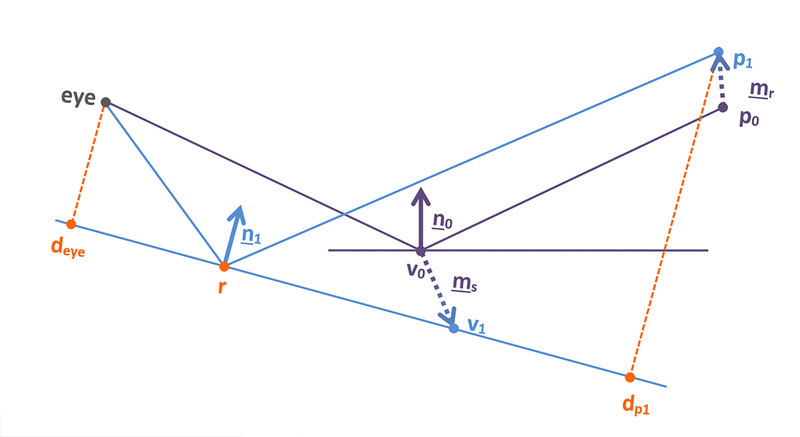 The video bellow compares the two reprojection method side by side. The idea of doing parallax correction on motion vectors for reflections came from the Stochastic Screen-Space Reflections talk presented by Tomasz Stachowiak at Siggraph 2015. Right now here's how it's currently implemented although I'm not 100% sure that's as correct as it could be (there's a PARALLAX_FACTOR define which I needed to manually tweak to get optimal results. Perhaps there's a better way of doing this)? Screen space reflections is one of the most difficult screen space effect I've had to deal with. They are plagued with artifacts which can often be difficult to explain or understand. In the last couple of years I've seen people propose really creative ways to minimize some of these artifacts that are inherent to ssr. I hope this continues! Hi, interesting post and very good results! I am not sure if I understand the "parallax corrected motion vectors" in last section; how do you correct them? Thanks! Hi Bart, I've just updated the post with a bit more info regarding this. I also added some code for the reflection reprojection. Need to get better at writing more thorough blogs. Right now I'm going with a "something" is better than "nothing" attitude :) Thanks!